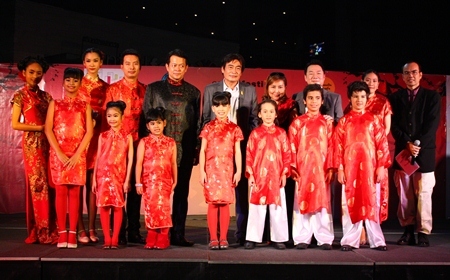 Pattaya will help celebrate Chinese New Year with a beauty contest featuring women in Qipao dresses. Deputy Mayor Ronakit Ekasingh joined Central Festival Pattaya Beach General Manager Saran Tantijamnaj and Chankit Na Ranong of Pattaya Entertainment Republic Co. Jan. 21 to announce the mandarin dress competition Feb. 10. The grand announcement was a show unto itself, with song, dance, and martial arts exhibitions. The “year of the snake” celebration marks 46 years of relations between Thailand and China and, city officials hope, will promote Chinese tourism to Pattaya. 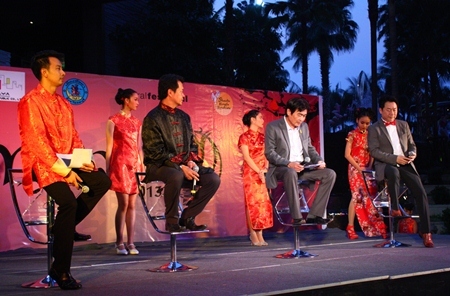 (L to R) Naddakorn Supharak, Chankit Na Ranong, Deputy Mayor Ronakit Ekasingh, and Central Festival Pattaya Beach General Manager Saran Tantijamnaj announce the upcoming Miss Qipao 2013 at Central Festival Pattaya Beach. Qipao dresses, more commonly called “cheongsam,” are snug, one-piece dresses won by both men and women in China. However, the stylish and often tight-fitting qipao is most often associated with today with those created in the 1920s in Shanghai and made fashionable by socialites and upper-class women. First prize in the pageant to be held at Central Festival will carry a 30,000 baht prize and gifts worth another 30,000 baht. Contestants will be judged not only on their attire, but talent as well. For more information, see Facebook.com/missqipaocontest or call 038-730-844. Contestants can register through Feb. 5. 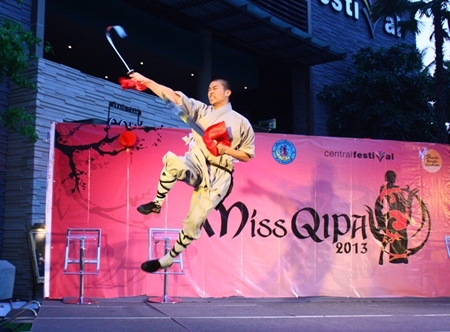 A martial arts student from Shaolin Kung Fu Syndicate flies through the air during his demonstration. Hi ya! 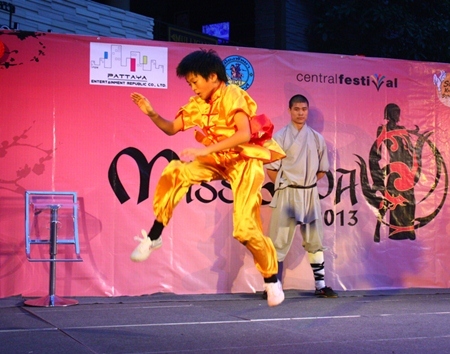 Another student takes to the air during his Kung Fu performance. 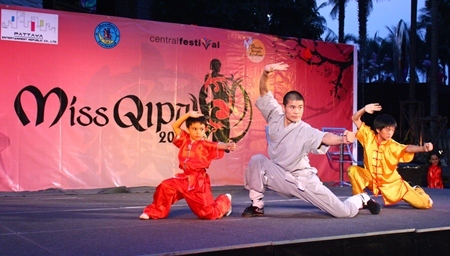 Students from the Shaolin Kung Fu Syndicate demonstrate Vusu Shaolin Kung Fu. 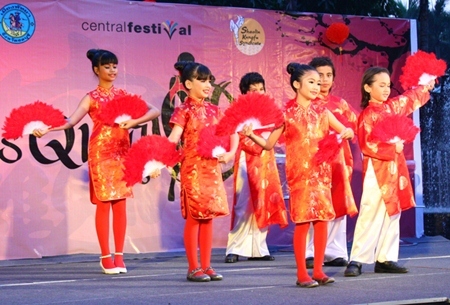 Children from Pattaya City Academy perform a fan dance during the press conference.